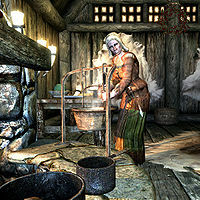 Bolfrida Brandy-Mug is a Nord farmer who lives and works at Brandy-Mug Farm, a short distance east of Windhelm Stables. She lives with a goat and two chickens. She grows wheat and snowberries in the field beside her small cottage and will pay you five gold for every piece of wheat you bring to her. She wears some farm clothes, a pair of boots, and a hat. 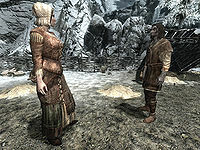 She wields an iron dagger, and carries a key to her farmhouse and some common loot and gold. She gets up early at 6am and eats a one-hour breakfast. She then goes out at 7am to her farm, and works for eight hours. When she is done at the farm for the day, at 3pm, she heads back to her house. She then hangs out in her house for a couple hours, eating a two hour dinner at 5pm, and going to bed at 11pm. She is friendly to visitors, saying, "Welcome, welcome, welcome! Don't see many strangers out here. Come to get your hands dirty on a real farm?" She also surprisingly seems to love her job and keeps a positive attitude, saying, "Nothing tastes better than food you've grown yourself. Something magic about dirt and sunshine making food." or "The weather's harsh, but I like to think my sunny personality is what helps the grain grow." This page was last modified on 9 June 2014, at 21:18.